No matter how beautiful your mailpiece, if it doesn’t make it to your customers and prospects, it’s worthless. Meeting the United States Postal Service’s (USPS) guidelines can be confusing and, if you skip a step, costly. Today, we’re going to break down the USPS guidelines for two of the most common mailpieces. To ensure you have the most up to date information, please check the USPS guidelines page here. Keep the top right 1.25 x 1.125 inches clear of text and images for the postage area. 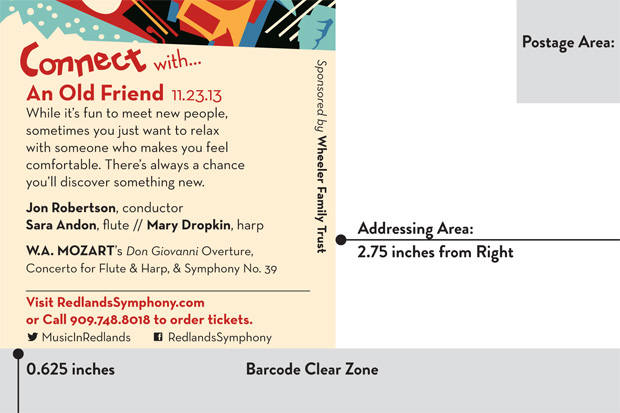 Keep the bottom 0.625 inches clear with no more than 7 percent opacity to leave room for the barcode. 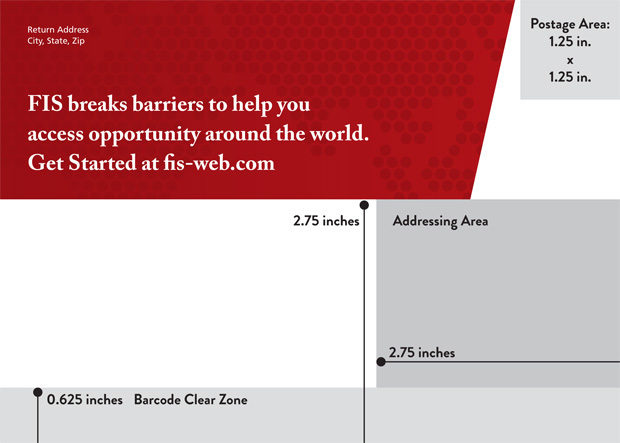 Keep a 2.75 x 2.75-inch area clear on the bottom right for addressing. Place your return address on the top left. For A-6 – A-9 envelopes (typically used to hold greeting or note cards), leave the bottom 2.75 inches clear for addressing and the USPS barcode. No matter your envelope size, be sure to maintain an inch margin - unless you are custom converting your envelopes from paper sheets - in which case, make sure your design’s bleed is ¼ inch. Different mail houses have different USPS mailing capabilities. This means, even if your mailpiece meets USPS regulations, your selected mail house can’t always send your mailpiece. We encourage everyone to talk with their printers, mailing houses, and the post office to make sure the piece can make it through each step - as well as sticking with trusted vendors that you know. The last thing you want is to get to the mailing date and realize your mailing house cannot send your printed pieces. Use at least 8pt for all addressing and return-addressing. On postcards and letters, be sure your return address is on the top left corner. Postcards can have a variety of sizes, but any size over 6 x 4.25 inches will be considered First Class mail. If you are mailing on a budget, keep your postcard to 6 x 4 inches. 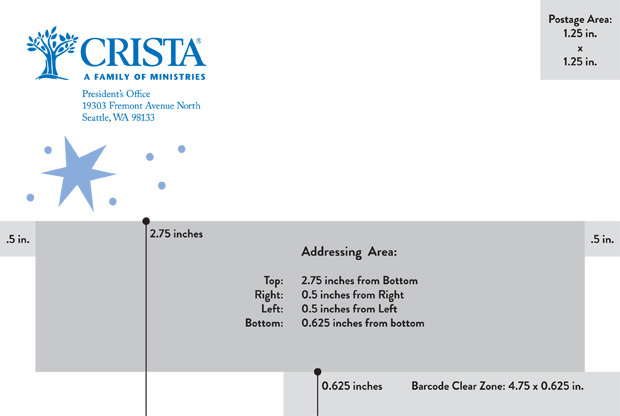 USPS has a decent webpage that visually describes appropriate sizes for letters, flats, and postcards. The grey areas on the examples above are meant to demonstrate regions and should be clear of design text, color, or graphics. These guidelines suggestions based off on the Post Office’s guidelines. Please be sure to check with your Post Office before printing any documents en masse.